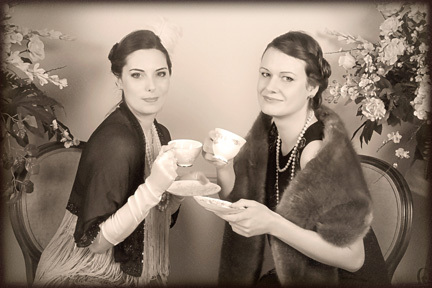 Our vintage etiquette class is a fun, original activity for hen parties and groups of wannabe ladies! Have this during your afternoon tea in Oxford, London, Henley on Thames, or Reading. Designed to take place during an afternoon tea, Aunty Maude will join you during your tea and cake and teach you how to walk and sit correctly, drink tea and laugh like a lady, and will also drill you on the do’s and don’t s of married life, with sweeties for the best behaved. You can choose your era for this, 1920s, 1930s, 1940s or 1950s. We can come to your home or holiday accommodation but you must have some teacups or champagne glasses and cakes on hand for the lesson!